It is no great secret. 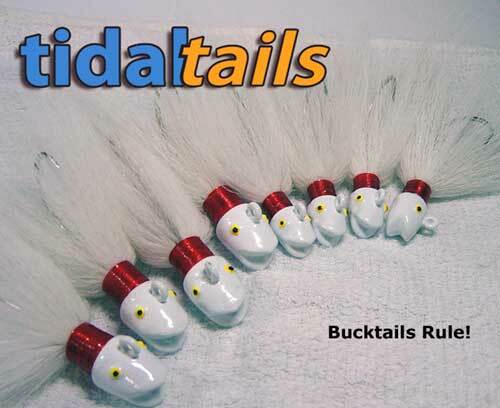 Bucktails take a lot of fish in saltwater or fresh water. Used with your favorite trailer such as pork rinds, curl tail grubs, shad bodies or whatever you want. It is not only productive but a tremendous amount of fun at the same time. From fishing for Striped Bass, Weakfish,and Fluke. Truly a must for your tackle box. This is our biggest seller and has taken fish consistently for many years. It is our go to bucktail for most conditions. The unique action of the Tapered head Bucktail really gets the fish's interest. Available in many sizes and colors, with two different hook styles and a durable powder coat finish. 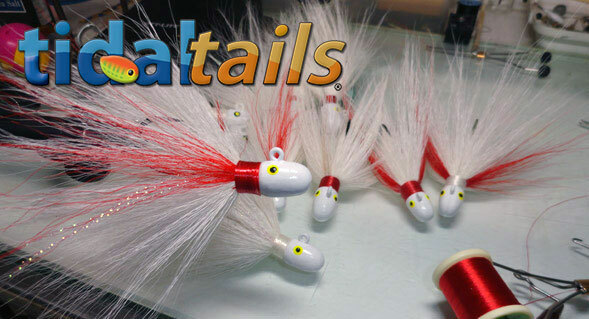 An awesome all around bucktail which can be used for most angling conditions. Tied Full with the best Northern Deer tail we can get. Flared collars for a fuller bucktail. Stay's up in the water column. Available in many sizes and colors, with two different hook styles and a durable powder coat finish. 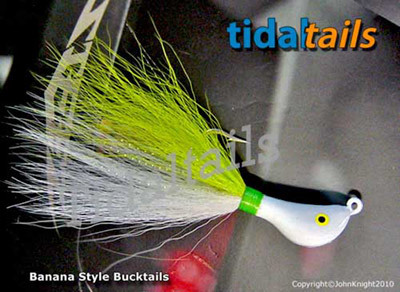 This is a current cutting bucktail. This jig overcomes the up swell currents and gets down where the big ones play. River fishermen find the Flat Head Jig ideal for reaching fish below locks and dams. Saltwater fishermen find the thin flat shape allows lighter weights to reach deeper depths. 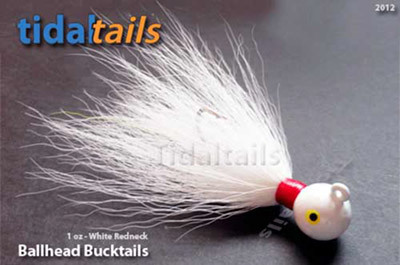 The Ball head Bucktail has been a very popular bucktail for mostly all fishing conditions. It has taken more than it's fair share of fish in all waters. 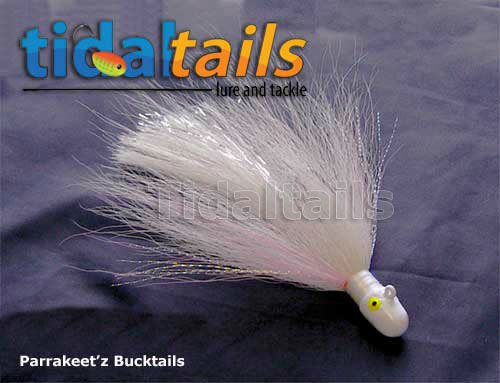 It also is a fast sinking bucktail as well as a long distance casting bucktail. Available in many sizes and colors, with two different hook styles and a durable powder coat finish..
Use with light tackle spinning gear or baitcaster. 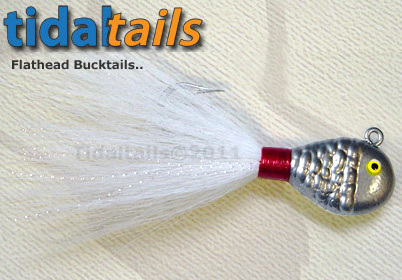 Race Bullet Bucktails - 1 1/4 oz with an 8/0 Hooks. This Is a 1-1/4 ounce deep water trolling bucktail with a larger 8/0 Extra Strong Mustad®Hook. Tied nice and full for great undulating action. Two or Single Hook Bucktail for Fluke . Ideal for strip baits, such as bunker or whole squid. Hardly anything gets away from this lure. Dubbed the fluke jig for dummy's. The second hook is a Lazer Sharp Nickel Hook with a rubber coated eyelet to keep it in place which can be removed for use as a single hook lure. Powder coated, and extremely durable ! 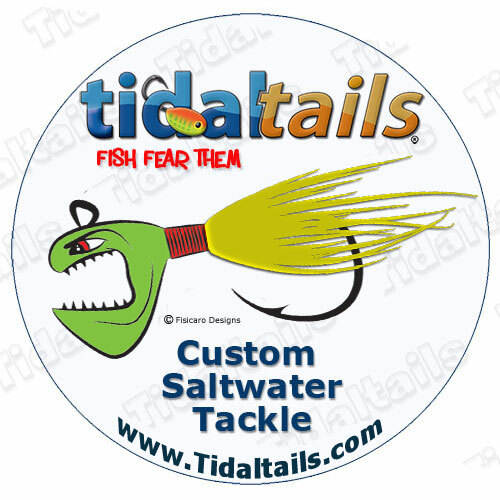 Tidaltails® Lure & Tackle, Co LLC.©2019 All Rights Reserved.